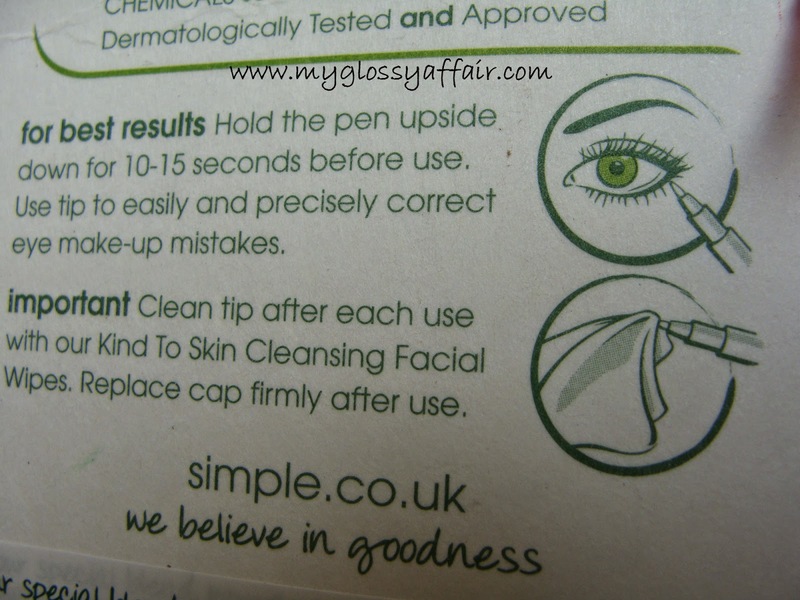 Simple is a United Kingdom based skin care brand. As it claims, Simple have been the experts in sensitive skin since launching the first perfume and colour-free soap in 1960. They claim of creating skincare products suitable for all skin types, even the most sensitive. Simple says – never use perfumes, dyes or harsh irritants that can upset your skin. 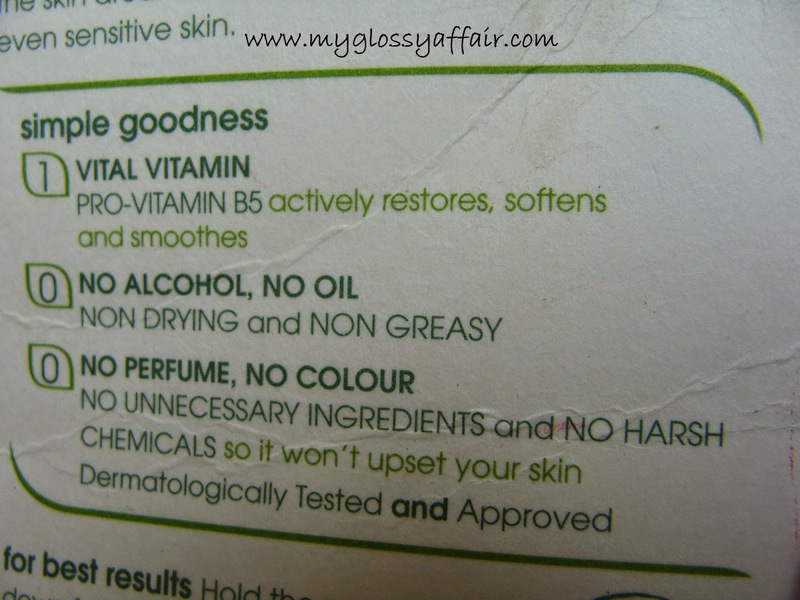 Simple says – trust the natural goodness in all of our products especially for sensitive skin. The reason that its in demand is that the prices of Simple products are really low as compared to other cosmetic brands available. You can say its one of the least expensive cosmetic brands available in United Kingdom, Unites States and Australia. What I liked about simple is that they provide a complete ingredient list of all the products on their website and the products are really cheap. 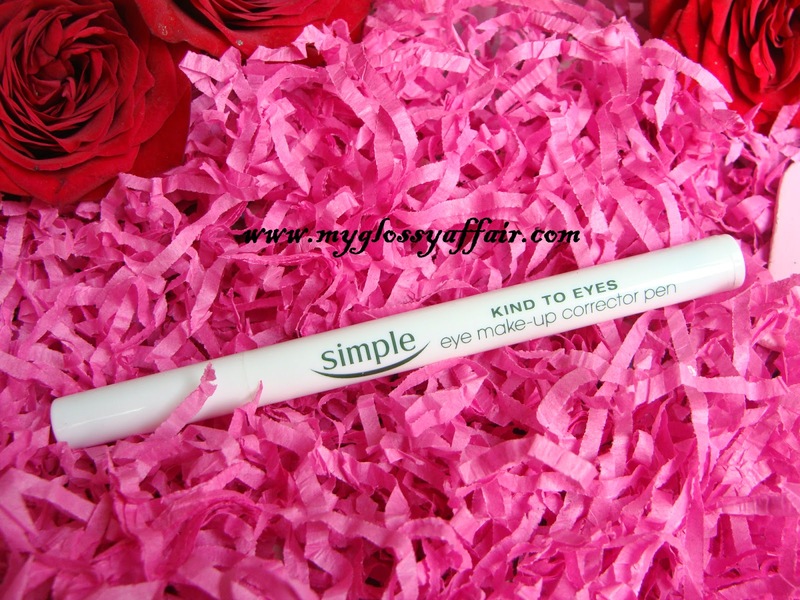 Let’s come back to “Simple Kind To Eyes Eye Make-up Corrector Pen”, a product which is like a magic stick for all makeup maniacs out there. I got this eye makeup corrector pen as a gift from my sissy, Ritcha. And I was really amazed when I used it for the first time. I was trying winged eyeliner or a party and my son came running and my hand went into wrong direction. Usually I have used makeup remover in such situation or a wipe. Then I thought of giving this product a try and it was the easiest option available at that time. To my surprise it really cleaned the liner leaving no mark behind and it has non greasy formula. It really wiped my waterproof liner and yes it can be used to wipe any makeup mistake like eyeshadow fallout, mascara on skin and any lipstick or liner line.This is a perfect product to wipe off any kind of smudging and is very easy to carry anywhere. 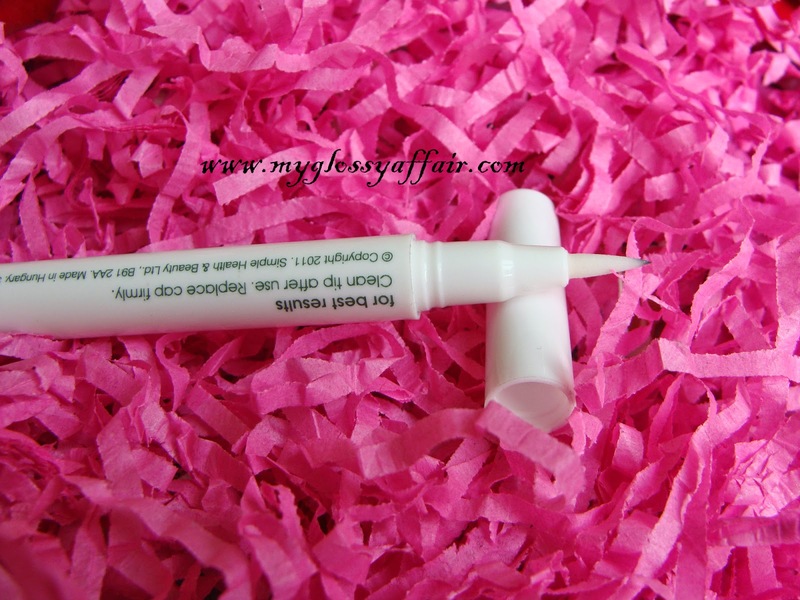 Simple eye makeup corrector pen contains Pro-Vitamin B5, which is known for softning, smoothing and restoring skin. Simple formula is free from alcohol, fragrance or colors so its good for sensitive skin too. 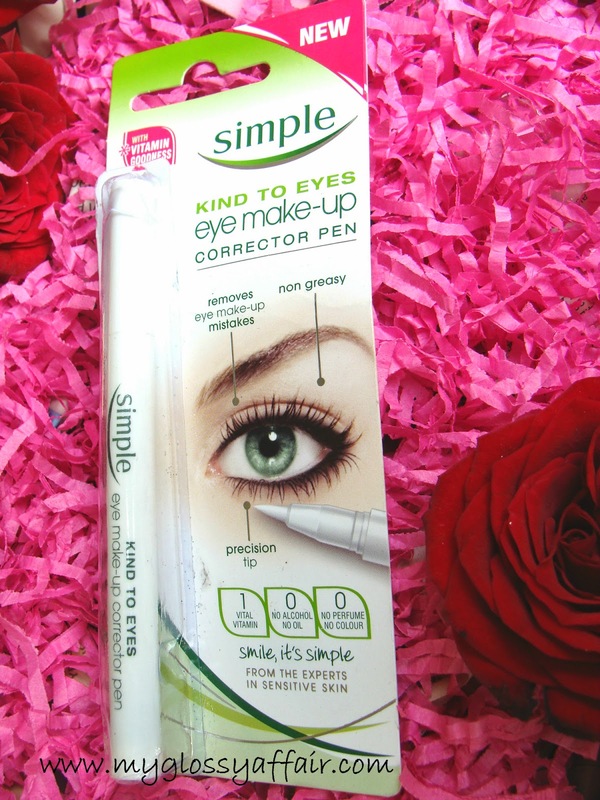 “It’s time to wave goodbye to make up mishaps and make room for a new handbag essential… introducing the new Simple Kind To Eyes Eye Make-Up Corrector Pen. Its ingenious pen-like design dispenses the award-winning Simple eye make up remover, so you can precisely and easily wipe away those day-to-day make up mistakes like smudges, flaking, streaks and even waterproof mascara, while leaving the rest of your make up untouched. Even better, it contains Pro-Vitamin B5, and with no perfume and no colour, it’s suitable for the delicate skin around your eyes, perfect even for sensitive skin”. The perfect tool to easily remove eye make-up mistakes, even waterproof mascara. 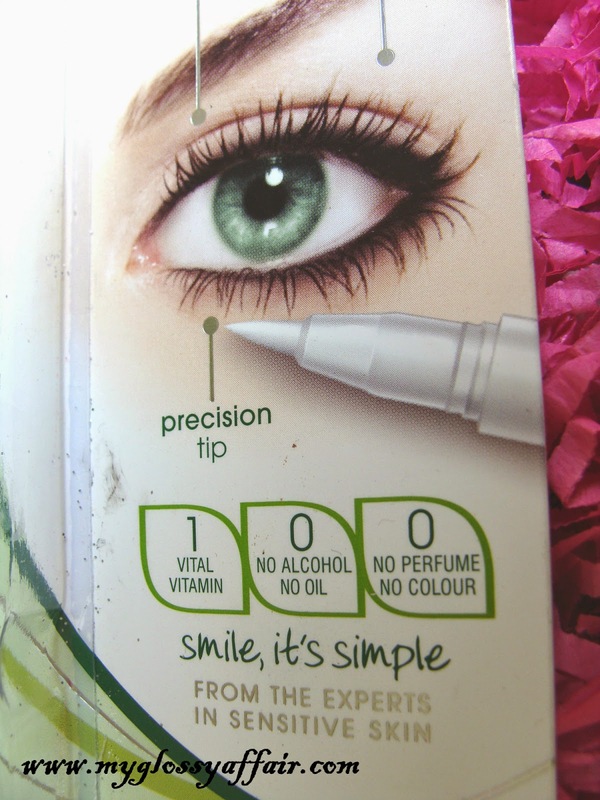 The precision tip allows you to correct mistakes leaving the rest of your make-up untouched. Perfect for even sensitive skin. Aqua, Poloxamer 184, Butylene Glycol, Ceteareth-20, PEG-20 Glyceryl Laurate, Laureth-23, Panthenol, Disodium Phosphate, Calcium Disodium EDTA, Chlorhexidine Digluconate, Sodium Methylparaben, Sodium Phosphate, Citric Acid, Pantolactone. Excellent for correcting makeup mistakes. Gentle for eyes and skin. Precision tip makes it easy to use. You need to clean the tip after every use properly else it will leave streaks. 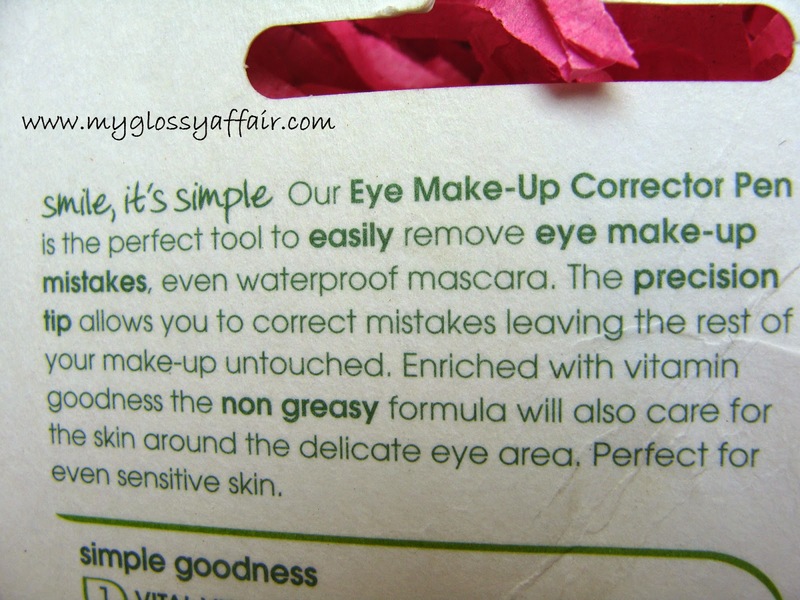 I would surely recommend such a thing as it becomes so simple to correct all those eyeliner mistakes and other such mistakes. such a must have item XD But, I don't know where I can get it in my country. Wow this is such a useful product, I don't think we have this brand in our country, lovely review dear. These sounds like a great nifty device. I am definitely picking this up.